Hello readers, today I want you to help me and your fellow guitar learners. I plan to create a free report with some of the best tips and advice from Not Playing Guitar. I'd like your help to ensure the report is a really useful resource for guitar learners, you can help me to select your favourite tips. The report's goal is to provide tips to make learning the guitar easier and more enjoyable. I'm thinking of things like practicing effectively, figuring out what to work on, keeping motivated, and so on. There won't be so many technique or song lessons in this report (but I will give some pointers to where to get those). As well as tips already published on the site I plan to include some stuff that hasn't made it here yet. So don't forget to return to Not Playing Guitar to download your copy when it's available. To make the report as useful as possible I'd love to hear what tips have done the most to help you learn guitar. Let me know what tips you found most useful, a little description of the problem they solved for you and how would be most welcome if you feel up to it. Simply scroll down to the bottom of this post and click the "comments" link - shown by the red arrow in the image. If you're on the post page, rather than the home page then the link is "Post a Comment", shown below. If you're reading it in a feed reader or email then you'll have to click the post title to go to the site first. 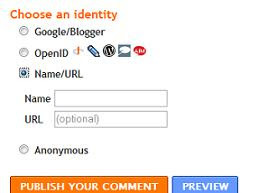 Anybody can leave a comment, if you don't have a Blogger account you can select "Name/URL" or "Anonymous", as shown below. To help get you thinking I have listed some of the tips I am thinking of including below. Maybe your favourite is there already? Great, let me know why you like it. Here is a list of a few of my favourite tips from the Not Playing Guitar archives. Make friends with the metronome. Of course, maybe you don't like some of these tips. Speak up and say why - your view counts just as much as mine. I'd like to finish off by thanking in advance all of you who take the time to leave a comment. I'm looking forward to making a useful learning resource for us all. You should be able to download your free report about two weeks from now, don't forget to come back for your copy - it will be completely free. You can sign up to the RSS feed (get it by email) to be sure you don't miss it. Great site and great help or tips. Please consider me a tester or guinea pig. And if I have not said it in awhile: THANKS for all your help. Hi Mike, Nice to know you appreciate the site. Do you have a favourite, or most useful, tip to share with other learners? I have to apologize for that. I tend not to read everything... until it's too late. Yes, I do have a favorite NPG post: http://www.notplayingguitar.com/2008/10/build-your-guitar-finger-independence.html/>guitar-finger-independence. I have already passed this over to all the real and virtual people that I know. Next to a Grip Master or hand exercise tool, this is the next best thing. Hey...I love the title and theme of your blog. Nobody thinks about the fact that when you're studying tips on how to play, you're not ACTUALLY playing, which is the key to learning guitar. This site's great for beginners like me who don't know so much about guitars yet, but are learning. Thanks! Hi Beginner Guitar Lessons, Thanks for dropping by, and for your encouragement. Probably the best tip I can offer is finding a tutorial style that you can really relate to. Most online courses have a free trial so you can see if they are up to your liking. An easy to follow training system that you really enjoy makes all the difference.